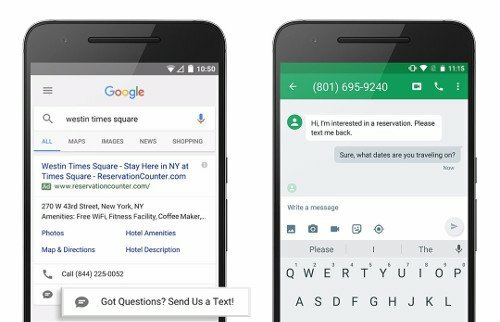 Recently Google announced a new extension for Adwords customers to use in text ads: click-to-message. Much like the popular click-to-call extension, the message extension is a mobile-only ad extension that allows people to directly contact you through your Adwords advertisements, without needing to visit your website. The possibilities for the new messaging extension are huge, especially for nonprofits hoping to connect with younger, mobile-savvy audiences. What makes this new extension so special? Keep reading to find out. What Is the Message Extension? The new click-to-message extension is one of many ad extensions that users can add to their text ads on Google’s Adwords advertising platform. There are several types of ad extensions, including ones that add your business’ address to your ad or display multiple links to your site. However, they all have the same goal: Get more people to click on your ad. The message extension works similarly to Google’s call extension. Underneath your ad will be an option to send a text message to get in touch with someone at your business. When a user clicks on this option, they will automatically be taken to their messaging app where they can send you a text as usual. Organizations using the message extension also have the opportunity to write a “suggested” text for people who click on their ad. This text will automatically appear in the text entry field when the message app opens, though users will be free to edit it as they wish. This suggested text can give you a good way to connect with potential clients before the conversation even begins by anticipating their needs and focusing your message around them. Why Is the Message Extension Good for Nonprofits? One of the biggest benefits of this extension is how it allows nonprofits to connect to a younger, mobile-focused audience. For instance, a nonprofit pregnancy center focused on helping women in crisis pregnancies can use this extension to connect easily with teens and younger women who are more likely to use a smartphone instead of a computer or laptop. Another benefit of this extension is convenience. With a call extension, you need to make sure someone is available to answer calls and talk to clients. In contrast, text messaging allows one person to handle several client conversations at once, and to respond to messages as they come in without worrying about putting people on hold. Text messages are also beneficial because many people are more comfortable with the relatively private and removed nature of text messages versus more intimate phone conversations. For clients requesting services or help from your organization, texting might be a more private and comfortable way for them to communicate. Like all of Google’s ad extensions, the message extension doesn’t have any additional cost beyond a regular Adwords ad. That means if you’re already paying for Adwords – or if you make use of a Google Grant to get free advertising on the platform – you won’t see any additional costs from making use of this new feature. Finally, text messages have the benefit of creating an immediate record of all information in a conversation. With phone calls you have to be sure to have good record-keeping practices in place, but texts allow you to refer back to earlier messages easily. That means you can focus on the conversation itself rather than on taking notes. If you’re interested in setting up message extensions in your Adwords account, simply follow the steps outlined in Google’s Adwords Support Page for Message Extensions. If you need additional help or advice in setting up your message extension, or you don’t have an Adwords account yet, you can also contact us for help. The phone number used for receiving text messages from clients must connect to your business or organization or to a representative of your organization. You can’t direct text messages to a third party or external service. You must respond in a timely and appropriate manner – no excessive delays. Also, once someone texts you, that doesn’t give you license to send them promotional or unrelated text messages afterward. Finally, you aren’t allowed to ask for any financial information or any government-issued identification data in text messages. If you want to take donations or get detailed data about your clients, you’ll need to talk over the phone or set up a secure system on your website. If you want to use Adwords and other online advertising to help your organization succeed online, contact RankMonsters today. We specialize in working with 501(c)(3) organizations who want to reach more customers and clients online. Call us today to learn about how your organization can make use of Adwords and qualify for a grant worth $10,000 per month in free advertising from Google. Call (405) 605-8218 now, or visit our LinkedIn page for more insight, news, and advice.